Podcast - Michael Oher "I Beat the Odds"
Stephen Usery interviews professional football player and Memphis native Michael Oher about his memoir, I Beat the Odds: From Homelessness to the Blindside and Beyond. 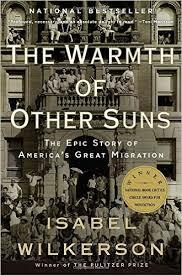 Podcast - Isabel Wilkerson "The Warmth of Other Suns"
Stephen Usery interviews Isabel Wilkerson about her critically-acclaimed and commercially- successful first book, The Warmth of Other Suns: The Epic Story of America's Great Migration. Pulitzer Prize-winning journalist Wilkerson contends that the movement of African-Americans from the South to other parts of the United States from World War I to the early 1970s is the most under-reported stories in our country's history. She follows the lives of three people examining the different social and economic reasons for leaving the South and Jim Crow behind. Podcast - Kevin Brockmeier "The Illumination"
Stephen Usery interviews Kevin Brockmeier about his new novel, The Illumination. It's the story of six people and how they respond to a strange, new development around the world when human pain begins to manifest itself as visible light. It investigates the philosophical, religious, artistic, and emotional ramifications of not being to hide one's pain or ignore another's. Stephen Usery interviews Philip Stephens about his debut novel Miss Me When I'm Gone. It's the story of a folk singer who returns home to Apogee, Missouri in the Ozarks Mountains when his mother falls ill. The town has changed much over the years, in no small part because his brother's real estate development business, and everyone is on edge when an ex-con drifts into town. Philip Stephens - "Waiting on the Years" from stephen usery on Vimeo. Podcast - Mary Jane Clark "To Have and to Kill"
Stephen Usery interviews best-selling author Mary Jane Clark about the first book in her new mystery series, To Have and to Kill, which introduces us to Piper Donovan, a down on her luck actress who moves back in with her parents and gets more than she bargained for when she agrees to make a wedding cake for her soap opera star friend.